Adding to the depth that made the last release in this tactical combat series so successful, Ubisoft’s Ghost Recon 2 Summit Strike offers an interesting new set of missions that takes players to remote regions of the world. The mountainous terrain poses a new set of risks and rewards. 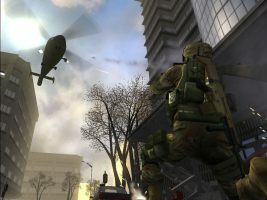 The game includes more than 24 multiplayer maps, and many new modes of play is the addition of many new weapons to use. Summit Strike also includes new environments and weather effects, with snow-capped mountains making for an entirely new type of challenge. This excellent installment exceeds expectations with solid solo and multiplayer action, new features and weapons plus some impressive visual effects that make for a solidly entertaining title. Most expansion packs are notorious for offering little in the way of depth. Fortunately, Ubi Soft and Red Storm's Ghost Recon 2: Summit Strike for the Xbox goes against the grain. Far from just a few new levels, Summit Strike is a completely stand-alone title that offers a unique set of gameplay modes and challenges. In fact, calling Summit Strike an expansion pack is almost an insult, since you don’t need the original Ghost Recon 2 in order to play SS since the game’s missions are almost entirely self-contained. However, experience with the first game will allow players to jump right into the action, since both games share a similar structure, controls and, interface. Ghost Recon 2: Summit Strike diverges from the previous game with a much tighter focus and streamlined storyline. 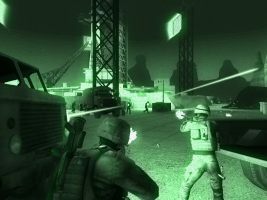 Set in 2012, the game has your team of elite combat commandos bravely trying to rid the unstable country of Kazakhstan of a terrorist leader named Rahil. This is an extremely dangerous foe, who’s responsible for assassinating the Kazakh President. The ensuing chaos engulfing the country has given him the perfect opportunity to slip away without being captured. In response to these events, the US Government has sent you and the Ghost team behind enemy lines to rid the country from Rahil’s grip. The single player game features 11 different missions that encompass a variety of different areas ranging from snow-capped mountains, brutal urban combat in city locations and murky swampland. This gives Summit Strike a surprising amount of variety, with each mission offering a different look and feel. Summit Strike’s missions offer an excellent variety of tasks ranging from solo infiltration missions, recon missions, firefights and more. The missions are open-ended, meaning you can approach objectives from different angles and routes, giving you a great deal of freedom in how you complete each mission. You don’t need to complete the objectives in a set order either, adding to the game’s sense of realism. Some of the missions allow you to command other members of the Ghost team, while others have you playing solo. Each mission is loaded with enemies as well, who will attack you from the ground and air, and can flank the player if you aren’t careful and alert enemies to your presence on the ground. Before each mission begins, players can equip their soldiers with a variety of different weapons and gadgets including pistols, assault rifles, sniper guns, grenades, and missile launchers. Summit Strike includes 15 unique weapons in all, including a special SCAR Assault rifle, with a modular construction that gives players plenty of firepower at their disposal. The auto-default inventory is usually adequate, but you should still check your mission briefing to see what type of weapons to equip. Most of the game’s single player missions are excellent, with the same depth, strategy, and challenge you’d expect from a full game. However, Summit Strike’s online modes are its main appeal and the game delivers the solid, challenging multiplayer experience you’ve come to expect. Ghost Recon: Summit Strike includes two dozen different multiplayer maps, including many of the areas you’ll see in the main game. These range from outdoors areas to urban locales, each presenting a unique challenge for the player. Urban locales have more hiding places, but the natural cover in outdoor areas gives you greater leeway in how you progress through the mission. There are several different online modes of play available including team battles, solo attack, versus modes and deathmatches to name a few. In addition to these standard variations, there are also two unique online modes that add a new dimension to the gameplay. 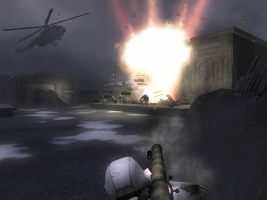 In the Helo Hunt mode, players have to face off against waves of enemy helicopters as they attempt to seek and destroy the Ghost Team. In Armor Attack mode, players have to seek out and destroy the enemy team’s armored vehicles. Both of these modes offer a unique challenge that gives Summit Strike a unique feel. 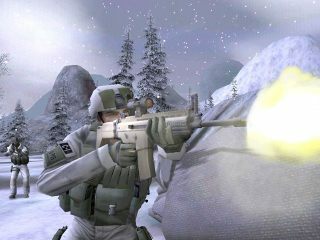 In addition, players can access a variety of new skins, including enemy forces and Ghost in their special snow camouflage and specialist outfits. As you’d expect, Summit Strike performs flawlessly online, offering the same intense tactical combat as the main game. The game’s control and interface are excellent, and don’t diverge much from the controls seen in GR2. Managing your inventory, directing your troops, and changing weapons is quite easy to accomplish. The GUI is smartly designed and doesn’t get in the way of the action. There’s also a sophisticated map feature, that allows you to zoom in and out to see where enemy forces and the locations of objectives at a glance. From a visual standpoint, Summit Strike delivers the realistic, immersive action players have come to expect. The richly detailed environments offer a great deal of variety, with excellent attention to detail that adds tension and excitement to each mission. 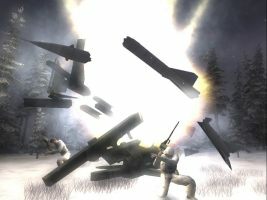 Summit Strike’s biggest new addition in the visuals department lies in the special weather effects, with the new snow stages offering a particularly impressive experience that’s unique to the franchise. The falling snow lends each environment a different feel that gives players a completely different environment than players have come to expect from the series. There are other impressive areas in the game as well, with the desert areas and urban locations offering a particularly impressive set of visuals. Summit Strike also uses voice acting extensively, which helps to bring you right into the action – the voice-overs are decent and realistic, with each character given believable dialogue and personalities. This is another solid-looking title from Ubisoft and Red Storm that once again shows their mastery of military type games. While this seems like just a minor update to a popular series on the surface, Summit Strike offers the same highly polished production values as previous games in the series and takes good advantage of the Xbox hardware. While your expectations for something like this are probably low, Ghost Recon: Summit Strike exceeds them by offering more of another chapter in the adventure of the undercover ops team than a quickie with a few new maps and weapons. While the game’s overall length is somewhat shorter than a full-fledged release would be, this is still a satisfying title that offers plenty of depth. The solo game is excellent and unfolds at a good pace, while the online maps are smartly designed, offering plenty of options and variety in multiplayer mode. The game’s production values are superb as well, with new snow and wind effects adding to the realism and authenticity. Overall, this solid title offers plenty of value for the money, and it’s somewhat lower than normal price tag should make it an essential purchase for those who’ve enjoyed previous installments in the Ghost Recon series.